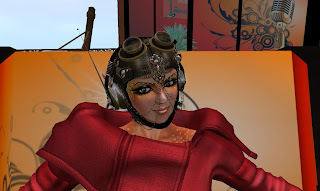 DJ Pilot, also known as Pilot of the Airwaves, or by her account name Otawan Fouquet, has been the DJ at some parties for Safra Nitely's Club Darkwing and the Relay for Life team Ministry of Dance, in addition to other locations such as the Taj Mah. I had first run into her in a chance encounter at the Blarney Stone in Dublin a few years ago. We recently met at her skybox for an interview about how she came to be where she is now. Of the skybox home, Pilot told, "A friend built it for me, was a gift. Trinity Delphin, she and I are good buddies. I encouraged her to be a DJ also. She used to be my agent. Very nice and sweet and good DJ in her own right." 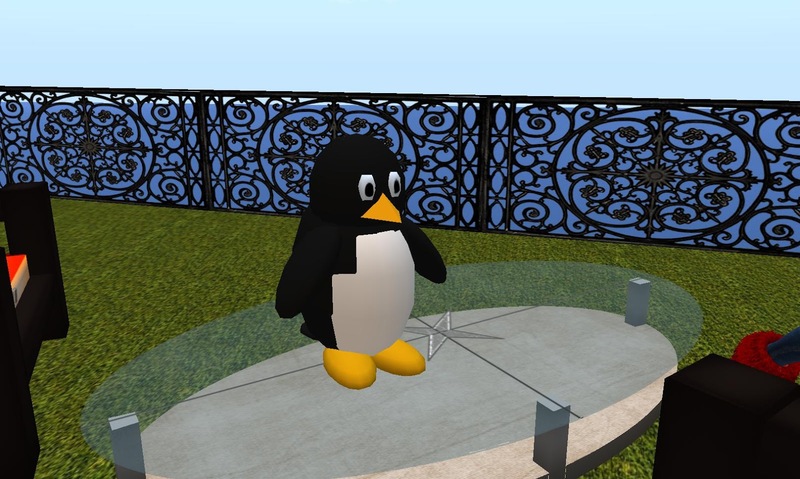 "So how did you find out about Second Life?" I asked Pilot. She answered, "After my husband passed away from cancer, a friend insisted that I join it. I did not like the idea, so she loaded it on my system and said 'now make a avatar.' I actually decided 'oh well might as well learn to build in here.' " I asked about her husband. She told me, "Melanoma ...it is a fast cancer. That is why I do the Relay for Life, hoping to find a cure. ... It was a bit of a shock, we were only married seven years. I was working, and just not doing anything but work. That is why (my friend) insisted on me coming in here." Asking her how her first days online went, her response was, "Pretty well, I was introduced to the Dublin sim and found out they needed hostesses. My friend who got me in here insisted I go there first because of my Irish roots. I was hired and became friends with With Cher Harrington and Ham Rambler. At that time she was the top dj and live music manager. After a year of hostessing, they asked me to try out for a DJ position because Cher liked my voice, laugh, and choice of music. It just snow balled after that. It was a flurry of events and Dublin was very popular then." When I mentioned the crowds Dublin gets every St. Patrick's Day, she stated, "Yes, we did loads of events for every major holiday. I met Safra Nitely at Dublin. I do not go there much (any more). It has switched owners, and they have not done too many events anymore. I was hoping it would last a long time." When I asked what happened, she answered, "Ham I suppose just lost interest or needed to deal with real life more. He decided to sell it, and it was a major undertaking to keep it going. There was 3 sims there. Now just one. I try to go hear the djs as much as possible, but with my schedule it is a bit hard." I then asked her, "How long before you found other places to DJ?" She answered, "oh I was asked immediately. 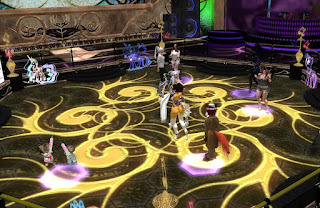 Heatbeats asked first, then Beau Belle, and I was still at Smooth Jazz Club too. We had a big following there also. But the owner retired , sold it and the new owner lost it. Another great club gone. We would have over 40 for my events alone." She told me Smooth Jazz had been holding events for over nine years. Pilot went on, "They came to hear me at Diegoland first. It was a part of Dublin then. I was their first entertainment. Then they hired live singers. It was well run and very efficient. (But) the owner just got tired of it and sold it." "I have been fortunate to be with some really great clubs," Pilot told me. I asked about others, and she answered, "Drunken Drow, It was a Elf community club. I played Saturdays there, Celtic and bluegrass events. I kept it at a minimum because they both had huge member lists and I was filling in too. Drunken Drow just shut down too, another one that had been around a long time. It had been there for over 7 years. Most the clubs I worked with were very stable. I also have done a couple of internet radio shows, DekaDance and RadioMetaverse. Dekadance (went) very well, they want me back. I am considering going back after my mum is more stable. RadioMetaverse is no longer, issues with the station manager. The manager was a bit of a hound, he was chasing the girls. I do not go for that business." Pilot soon brought up the Relay for Life again, "I have to be going soon because of the relay for life event. I do voicing for the closing ceremony (later today)." She went on, "Oh, I did do a long stint with the Changhigh Trinity Sisters. They are still around and working all the big events. I did all their music and announced the different tricks they did. They are fire dancers. I like helping Relay for Life. The Strangeworld group have been very kind of me." I asked how she met the Changhigh Sisters, and she answered, "Ah, at the Drunken Drow. The owner approached me to help them. I have done Snail Race music too, medieval opens, opening of new sims, such as the German sim, etc. Seems like everyone told them to contact me." "Sounds like you've gotten quite popular," I commented. Pilot responded, "well it is just a matter of being kind to people and being reliable. I tend to love the crowds too. They want someone who makes the crowd feel welcome and enjoy the fun. I get a big kick out of some of the gestures too. Safra has kept track of me and we wound up doing a set at her place, as you well know. It seems to be growing too. The new one, Shenanigans, is really going well." "When did you and Safra meet?" I asked. Pilot answered, "About seven years ago. She came to one of my events at Fibbers, a club in Dublin. It was a dance club, her and Danton Thirroul were great friends.He was another great DJ from England. Danton also encouraged me to do readings as well. I did several. Beowulf was one of my favorites. We would do classic books and use music to create a small two hour event. He had a club called 'O'Caseys.' It was down the street from the Blarney in Dublin." Pilot then paused for a moment, then spoke again, "Sorry getting hit with IMs, another one of the owners of Taj Mahal. I DJ for them on Sundays also." I asked if it looked like the real-life location in India. Pilot answered, "It is modeled after that. It is a big place.Voodoo Spyker owns it. She used to come to all my gigs at Fibbers." I then asked, "I take it there have been a number of evens something went hilariously unplanned, a glitch that had everyone laughing?" Pilot thought for a moment, "I am trying to remember ... Oh yes, we had one individual who came in one day and said 'great music but the DJ has a bad voice.' It nearly caused a riot. You should of seen the open chat, oh-em-gee! All the managers wanted to ban him, and I said, 'Oh hell, it is his opinion and everyone has a right to their opinion.' I just kept djing and having fun." "what happened with him?" I asked. "(I) have no idea," she told me, "never saw him again. I suspect he was an alt. I have also had other DJs tell me in IM that I was no good and stop DJing. I consider those pure cases of jealousy. I take it with a grain of salt and go on." 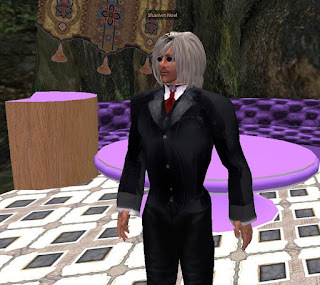 I then asked, "Besides DJing and the RFL, what else do you do in Second Life?" Pilot answered, "I train DJs, free of charge. I never charge to train DJs. I like pass on the knowledge. I do some building. I am about to start snail racing. I have been thinking of doing live music. I used to play in real life a lot. Safra is trying to get me to do that." "What kind of live music?" I asked. "Celitc and bluegrass," she answered, "Some rock. I played for years with my Father. I also play Keyboard." Pilot went on, "I used to do a lot of airplane and parachuting here, swimming, etc. I have done lots of posters for events and such. But I have been out for while with my Mother being so sick. ... she is better, Bixyl. She is 87, but faring well." I then asked about her pilot's leather helmet. She answered, "Oh yes that comes from my background in aviation design. I was a designer in real life, commercial and military components and flight simulators." She went on to say, "I met my real life husband now in here. ... Shawwn Noel ... We have been married seven years. He is a big geek like me, computers are his thing. The interesting thing is he was a female avatar in here when I met him, and became my best friend." I chuckled, "What was his explanation?" He did not want anyone female to bug him, so he became a small impish female elf who played hockey. It was pretty funny. He finally admitted to me he was a guy, and was attracted to me. He had the same last name I did in here: Fouquet. It was pretty funny really." "Not your usual way to meet a guy," I chuckled. "I still tease him about it," she mused. "He comes (to my events) once in a while," she told me, "but he is pretty busy with real-life work. He is a marvelous builder too, and scripter.I would love to see him get int the castle build contests." "How long were you together before you were engaged?" I asked. "A year," she told me, "I am a bit older than him and I was leery of marrying a younger man. But we are a lot alike. Mom told me 'You are crazy if you don't marry him.' She liked him right off. His Mom and Dad really liked me too. So both parents were good with it. ... Glad I was here for him. He lost his mom and grandmother. He needed someone to support and love him." "He comes in to my gigs and stands around," she spoke of him, "We call him 'Stoic Shawwn.' It's pretty funny really." "How did that get started?" I asked. Pilot answered, "I was on the mic one day and said, 'Pay no mind to the stoic avatar next to me.' And he would wear this huge katana, like he was protecting me. It was really funny. He is pretty funny in here. I guess it's his alter ego." 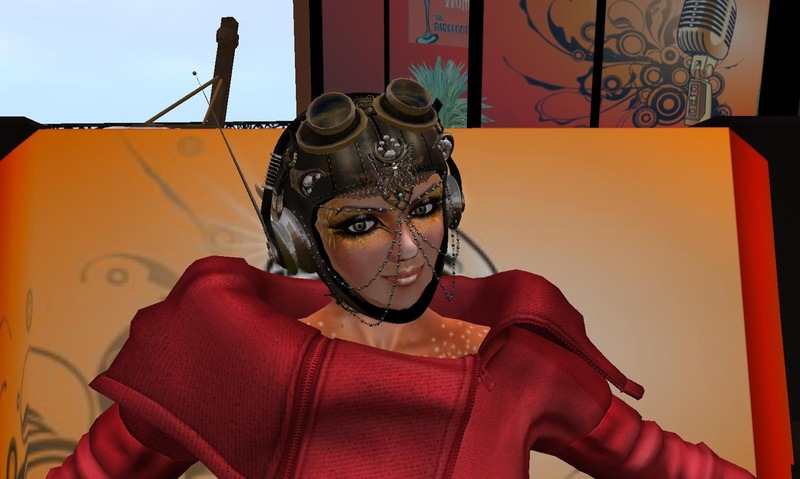 "Second Life is a fun place," Pilot spoke of the virtual world, "One of the best places I have found. It's a real community, and I have real friends here. I consider it my second home. The Lindens did a good thing here." 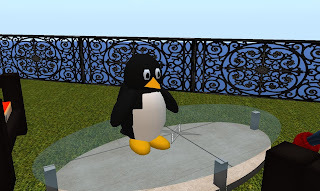 I then asked, "Anything to say about some of the items around here, such as the penguin?" I drew her attention to the prim bird on the table. Pilot answered, "Ah yes, they all reflect what I do. Yeah he is a piece from a friend that was an actual diver for the National Science Foundation. She just retired. Great lady, and I use to remotely DJ for her from Smooth. They were in Antarctica. They have heard (me) all the way to McMurdo Bay. All the divers would put in requests. That was very interesting and fun." I responded, "Antarctica? Getting there and going about there's quite a journey and effort. "Yes, she met her husband there," she told me, "He flew the C-130 that took them there. It is a long trip. She would contact by computer and say 'I am New Zealand now, on my way home.' She lives in Hawaii." She then told me she had to leave, "Bixyl I must check on my mother and get back in time to do the show." She asked if I had enough information, and telling her I had she logged out. DJ Pilot's real-life job resume, which she handed me in a notecard, is an impressive one, with jobs such as architectural coordinator, being a structural drafter/designer for the Star Building in Oklahoma City, working on design and prototype development for the Cessna Mustang air conditioning system, being a major designer on the V22 Osprey Flight Simulator, and the Boeing 777 jet stab trim controls, and having developed several Cad/Cam programs for the B-2, C-130, and F-16, F-22 flight assemblies. 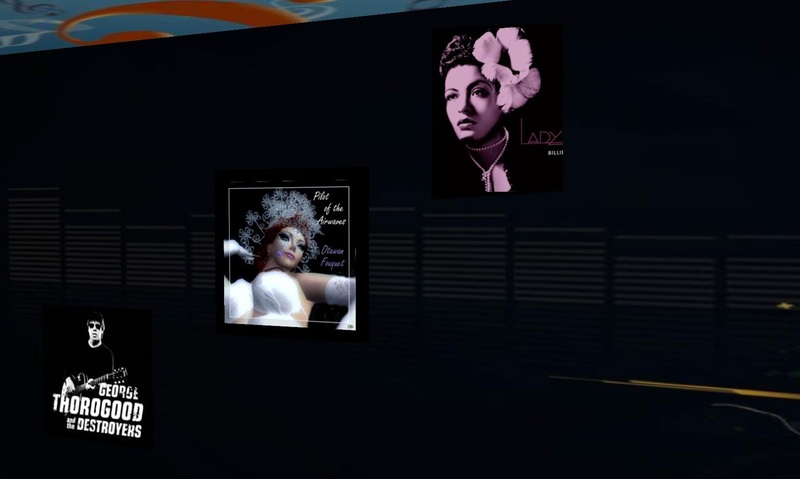 DJ Pilot can be found at a number of venues throughout the week, including Safra Nitely's Club Darkwing at Devon Dream (207/31/3992) during "DJ Pilot's Sunday Riot," on Sunday from 10AM to Noon SL time. Leona Kitty: "My Experience With Cancer"